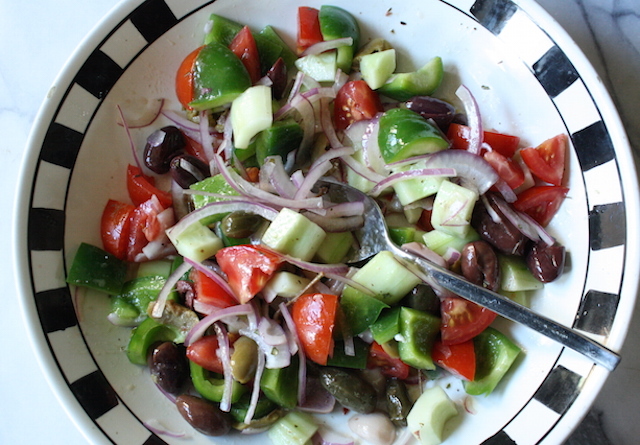 It’s something I make a lot over the summer without much thought – cucumbers, tomatoes, peppers, red onion, feta if I have it, a handful of olives – all mixed up and tossed with a bright, oregano heavy vinaigrette. It’s good, it’s filling and it satisfies my yearnings for something crunchy. Sometimes salads can be too composed, too pretty, too … precious. I am certainly guilty of creating these once in a while. But most of the time I just want something rustic, something thrown together. Something uncomplicated and delicious. This is it. Winter can be cold and dreary and depressing and I yearn for a little hint, a reminder of a happier, warmer time. A time not filled with squash, kale and root vegetables and a bright, sunny tomato that is red all the way through is my ticket out. So yeah, I will buy an out-of-season tomato on occasion. I’ve been getting really great local hot-house tomatoes lately and haven’t felt the least bit bad about buying them in January. If you’re going to do it, make it worth it. Do I have to turn in my chef whites now? The olives help too. Olives always help, their salty brininess cutting through the dreary winter flavors we’re already bored with. This time I bought a small container of mixed olives from the deli counter, a mix of black and green but also those big, wonderful caper berries and a few cloves of pickled garlic. They were good. The dressing here is simple. Into an old canning jar I pour red wine vinegar and fresh lemon juice. A small spoonful of mustard because it helps it all come together and stay together. A good glug of olive oil. And let’s not forget a healthy bit of oregano, because it’s really important here. A few good shakes and it’s ready though I like to let it sit for a while so that oregano permeates the dressing with its wonderful, grassy herbaceousness. The dressing could be described as a bit bracing, and tossed with the vegetables it is a brightness we all need right now. Sometimes I leave it here, just the vegetables, maybe the olives too. And most of the time, I let it sit for a while, to marinate and get a little juicy. Later, I might toss in some crumbled feta as I don’t like how it breaks down if the salad sits. And sometimes I serve it over some torn romaine, if I want to fill it out a bit. Depends on what I feel like, and what I have around. This time time I did all those things. Sometimes I’ll serve it with those little cheesy triangles, still warm from the oven. Let me tell you, that makes one hell of a lunch. You know what else would be good? I big pile of gyros meat from your corner joint right on top. Oh man. My Greek friend might call this recipe “horiatiki” and though I’ve made this in the spirit of dish, I think I’ve taken too many liberties to call it that. 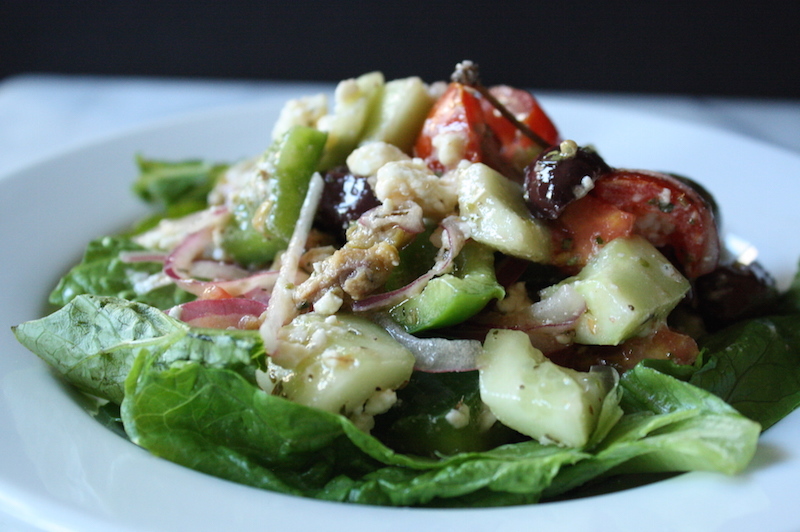 So I’ll just call it Greek Peasant Salad. It seems right. STRESS THERAPY BAKING FACTOR: KNIFE THERAPY. I really enjoy grabbing my biggest knife and whacking vegetables into big chunky pieces. It’s fun. No precise knife cuts, no perfect edges required. Just whack it up and toss it with a dressing. The only fussy thing I do is to rinse the red onions in cold water to remove a bit of the sharpness. Learned that from Rick Bayless and it works. This is that one salad that is supremely easy and always tastes great. It can sit for a few hours and is better for it. We’re all better if we sit for a few hours, aren’t we? Screw the lid on tight and give it a few good shakes to combine. Let sit while you prepare the rest of the salad. If not using within the hour, refrigerate until needed. For the salad: place the sliced onions in a strainer and rinse well with cold water. Allow to drain while you prepare the remaining ingredients. 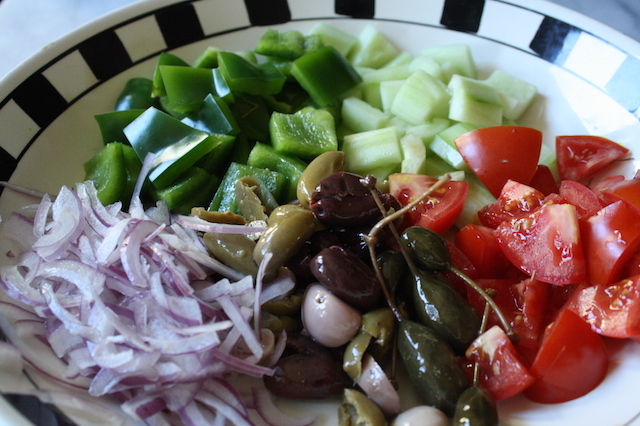 Prepare the cucumbers, tomatoes, peppers and pit the olives if you like. Add these all in a big bowl with the drained onions. Drizzle with the dressing and toss to combine. You can let it sit at this point for while for as long as you like. If more than ½ hour, refrigerate until you’re ready. 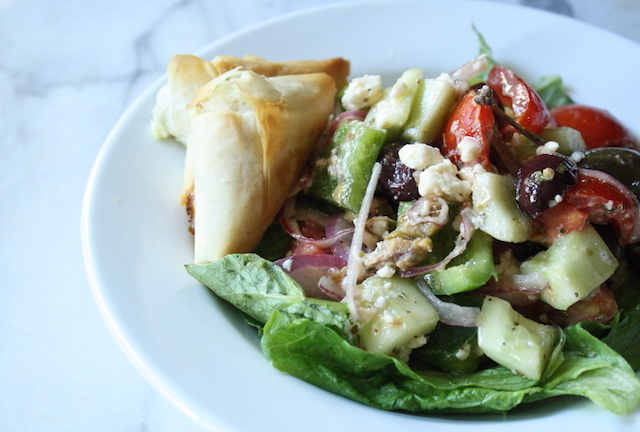 Just before serving, sprinkle the crumbled feta on top and toss lightly. Either toss in the chopped romaine, or serve the dressed vegetables on a bed or romaine. Serve immediately. To make ahead: the dressing can be made several days in advance; shake several times before using. The vegetables can be tossed with the vinaigrette a few hours in advance but add the feta and chopped romaine just before serving to keep crisp.